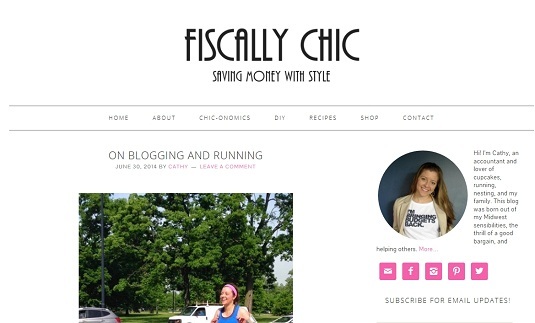 It's been several years in the making, but Fiscally Chic is now at its new home on WordPress! You can find me there at fiscallychic.com. I'm still working out the kinks and spiffing things up, so let me know if you have any feedback. And don't forget to update you're RSS feed. Thanks so much for reading along! And come on over to the new blog! I don't talk about it much on the blog, but I still have an Etsy shop filled with lovely Marimekko pillow covers. 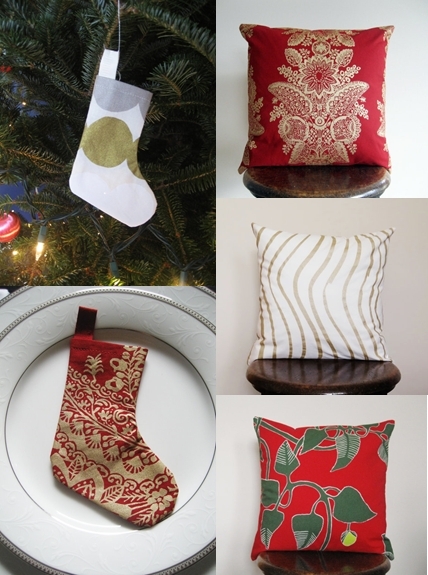 Around Christmas, I also stock mini Christmas stockings. Since it's currently Christmas in July, I thought I would bring back the mini stockings and have a sale! You can get 20% off through Sunday July 27 using the coupon code "CHRISTMASINJULY20"
While it appears to be all quiet on the western blogging front (it is summer, after all), I've been tidying up my blog design. (And moving to WordPress...eek!) At the same time, it's a battle to keep things tidy at home. As Monica has grown, so has her collection of toys and books. 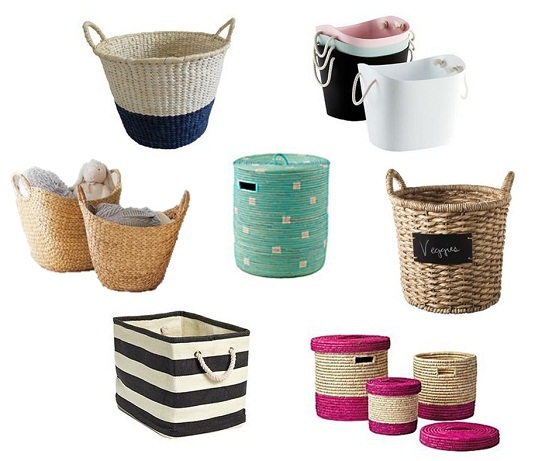 To contain some of the chaos, I bought the two baskets from the top row. Not only do her things have a "home," but it's easy to move a bunch of toys from one room to the other. Say, from the front room to our bedroom so she can play while we get ready in the morning. Or from the backroom to the back yard if we want to play outside. Now if only she can learn to put her toys back into the baskets! Be a cross country star, not a tennis star. I love tennis. It was my favorite sport in high school. But I always had a ton of respect for the cross country guys and girls. Not only because of their crazy ability to run long distances, but because of the mindset they had in regards to their performance. With tennis, if you beat your opponent you consider the day a success. With cross country, if you beat your own previous record you consider the day a success. Your journey of growing your blog will be much more fulfilling if you aim to outperform yourself as opposed to other blogs. Like blogging, I took a bit of an extended maternity leave from running. Sure, I ran a 10K this past October, but I wasn't running consistently. About three months before Monica's birthday, John's sister talked me into running a half marathon. I pulled up a Hal Higdon training plan, dusted off my running shoes, and got to work. The day before Monica's birthday, I ran my first half marathon in over three years. Was is pretty? Not exactly. But I went out there and finished. You have to start somewhere. Whether it's sitting down to write or starting to run after some time off, the hardest part is starting. For running, the hardest part is getting out the door. But once you get going and see your progress and improvement, the momentum encourages you to keep going. Ugh...I know. In blogging and running, you might have a few setbacks, like writer's block or a knee injury. You can either let it get you down or use it as a learning experience and moment of growth. In addition to having more experience, my blogging and running has improved (or become a little easier) as I've obtained the correct tools. For blogging, that would be getting a better camera (and knowing how to use it). For baking cupcakes, that includes finally buying a pastry bag and piping tips. For running, it's having a proper pair of running shoes, iPhone armband, and our BOB jogging stroller. Finally, sometimes I need to adjust my expectations and benchmarks of running and blogging. Going back to Bjork's point, "with cross country, if you beat your own previous record you consider the day a success." With my first post-baby half marathon, I couldn't compare that performance to my previous personal record. This time around, I didn't have as much time to train. As with blogging, there are only so many hours in the day and I think it'll be a good week if I post once or twice. That sure beats my current track record of posting once or twice a month! It's summertime, which means DIY projects and household improvements are filling people's weekend "to do" lists. The summer is also a prime time to buy a new house, which means you need to be prepared for repairs. If you're in either of these camps, you'll enjoy today's post sponsored by Gotstock. Whether you live in an apartment, condo, or house, you should have a few basic tools on hand to tackle simple household repairs. This isn’t about being an HGTV DIY expert; it’s just about being reasonably self-sufficient. Think about whether you would be able to deal with an emergency. If you don’t have to the tools to do this; you need to make a trip to the hardware store. This applies to both the ladies and gentlemen. What is the Best way to Acquire Tools? There are ready-equipped tool kits on the market which give you access to a variety of different sizes and types of tools. The problem is that the majority are not cheap, and you may not need all of the items in the kit. The best time to buy the very basic tools is when you first start running your own home. Then as you go on, you can acquire, rent, or borrow extra materials as jobs require them. So what are the essentials? These tools are probably the most essential of the essentials. Whether it’s changing an outlet or putting together furniture; a screwdriver always comes in handy. It's useful to have a selection of screwdrivers for different sizes and types of screws (i.e. flathead vs. Phillips head). A really small screwdriver is also helpful to tighten a loose screw on a pair of glasses or sunglasses; check out Gotstock for more on this. You don’t have to spend a lot of money on a hammer, you just need one that will do the job. This is pretty essential for a lot of basic household DIY tasks such as hanging a picture frame. A claw hammer also allows you to remove nails to take down furnishings in your home. Again, you don’t have to spend a huge amount of money on wrenches, but make sure that they can withstand a fair amount of pressure. You don’t want to leave a bolt unscathed and bend the wrench instead. If you're going to put shelves or curtain rods up, you're going to need a few holes and anchors in the wall. A cordless drill is the best way of doing this. Being cordless reduces the risk of tripping, but you still have to be really careful that you use it correctly. You hope you never have to do it, but unblocking a toilet is easy with a plunger. Tie a plastic bag tightly over the end and plunge with vigor; the toilet will be unblocked in no time. Yes, it is a bit big to fit in a toolbox, but it is an essential item for completing a lot of jobs in the home. Something as simple as putting a shade on a light, is a lot easier and safer when done off a stable ladder instead of a chair. Other helpful tools include a measuring tape, level, box cutter, pliers, and safety glasses. Storing tools safely is common sense, but sometimes people are in a hurry and items get left around the home. If this happens, a child might pick up a tool and do damage to the house, or worse to themselves. Ladders are also very important to be aware of. Never store them where there is a significant chance that they can be knocked and toppled over. A tool box or tool chest is ideal for storing tools, but at the very least, you need to make sure that they are protected and dry. This will ensure that you have a useful set of tools to use for many years. On June 8, Monica turned one! She started walking the day before she turned 11 months old, so turning one sealed the deal of her becoming a toddler (sniff). While I had a secret Pinterest board filled with birthday party ideas, I didn't go over the top crafting elaborate decorations. I ran a half marathon the day before her birthday, so we decided to keep things simple. We catered Buona Beef, served food on pink plates with pink silverware, bought a canopy for the backyard which we decorated with pink paper lanterns, and had several coolers of chilled beverages. One thing I didn't want to skimp on was the dessert. I had pinned several mini layer cakes as inspiration, but ultimately decided to bake cupcakes. 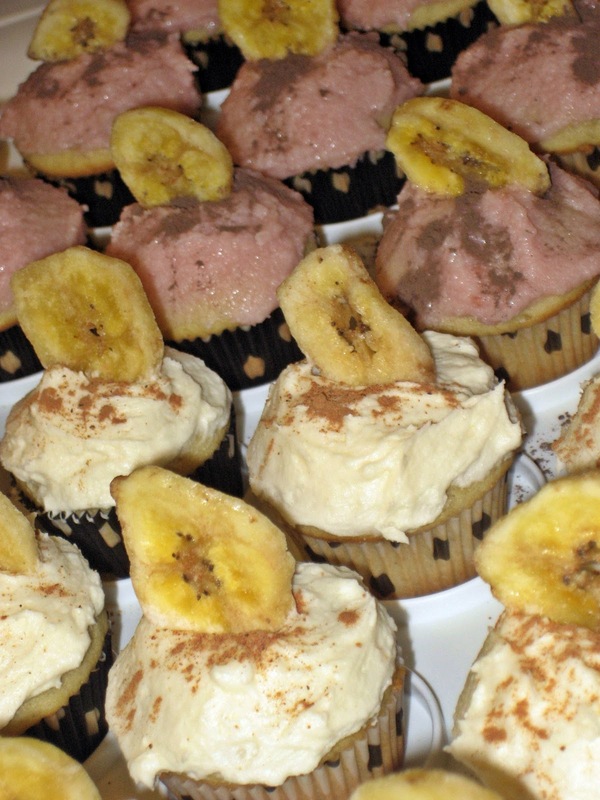 Since the loose party theme was pink, the cupcakes had to be pink. In addition to baking exactly what I Monica wanted, I could avoid hard to pronounce food additives and artificial food colors. Monica has been enjoying berries lately, so I decided to bake vanilla cupcakes with raspberry buttercream (strawberry being a close runner up). These weren't organic by any stretch, but I felt a little better knowing exactly what was in the cupcakes. In addition to Monica's current love of raspberries, these cupcakes were inspired by The Cup's Raspberry Beret cupcakes. I don't think I ever had this flavor, but The Cup can do no wrong, in my opinion. 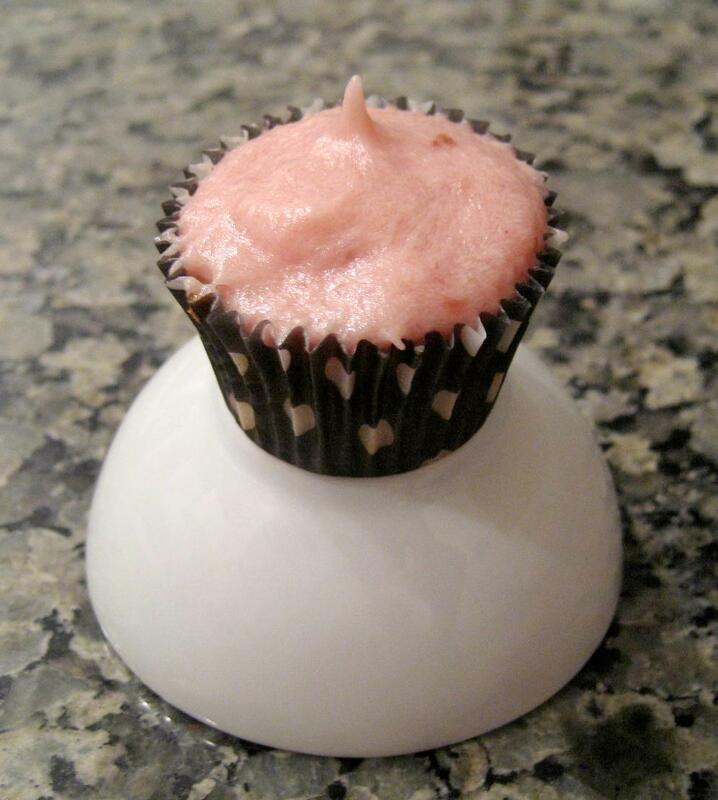 Monica's birthday cupcakes are also reminiscent of the first recipe I shared on this blog, raspberry champagne cupcakes. Obviously there wasn't champagne in these cupcakes. This may be one of my favorite pictures of Monica eating her birthday cupcake. Yes, there are other pictures of us singing to her and her enjoying her cupcake, but I love the expression on her face in this photo. It's like she's thinking, "Oh no! Cupcake down!" One last minute (and extremely playful) detail I loved from the party was using one of Monica's bath toys as a paperweight. I just grabbed the purple walrus and it just went perfectly with the pink napkins. The napkins and walrus might still be sitting on the buffet. Preheat oven to 350*. Line muffin tin with 12 cupcake liners. In a medium bowl, mix together flour, baking powder, baking soda, and salt. Melt butter in a small saucepan on the stovetop or in a microwave-safe bowl in the microwave. Transfer this to the bowl of your mixer. Using the paddle attachment, stir in sugar (the mixture will be gritty). Add in the egg, yogurt, milk, and vanilla extract until combined. Divide batter among 12 cupcake liners and bake for 20 minutes or until a toothpick inserted in the center comes out clean. Beat the butter using the whisk attachment on your stand mixer until creamy. Add in the pureed raspberries. Slowly add the powdered sugar, about one cup at a time. Finally, add the lemon juice and sea salt. Continue beating until very light and fluffy. Pipe* or spread frosting on each cupcake. Enjoy! *I bought the Bake it Pretty Best-Ever Cupcake Icing Kit (5 jumbo pastry tips and 1 pastry bag) just for these cupcakes and it was fantastic! You can currently save 10% off your order using coupon code "BALLOONS". The first outfit was inspired by my sister-in-law. She rented this very dress for a black tie wedding and looked gorgeous. While the wedding we'll be attending isn't this formal, it's fun to dream and hopefully inspire you. I'd say that this dress and ensemble is a little closer to what I'll actually wear to our friends' wedding. It's less formal than the pink dress, but still dressed up. I also love the colors and pattern of the dress. And that peek of pink on the pumps? Such a fun surprise! Finally, here's what I might wear if we were invited to an outdoor wedding. A bit more casual, but the necklace dresses things up. And the wedges will ensure that I don't sink into the ground while walking. *No, this isn't a sponsored post, I just really like RTR. If you also have a wedding on the calendar and are looking for a lovely dress at a lovely price, you can sign up through my Rent the Runway referral link, and we'll both get $20 off our next orders. Muchas gracias! Hi! I'm Cathy, an accountant and lover of cupcakes, running, nesting, and my hubs. This blog was born out of my Midwest sensibilities, the thrill of a good bargain, and helping others. 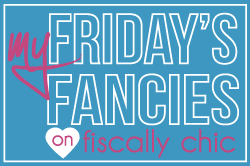 Click the picture for more about me and Fiscally Chic.